Practical Intranet Security focuses on the various ways in which an intranet can be violated and gives a thorough review of the technologies that can be used by an organization to secure its intranet. This includes, for example, the new security architecture SESAME, which builds on the Kerberos authentication system, adding to it both public-key technology and a role-based access control service. Other technologies are also included such as a description of how to program with the GSS-API, and modern security technologies such as PGP, S/MIME, SSH, SSL IPSEC and CDSA. The book concludes with a comparison of the technologies. This book is different from other network security books in that its aim is to identify how to secure an organization's intranet. 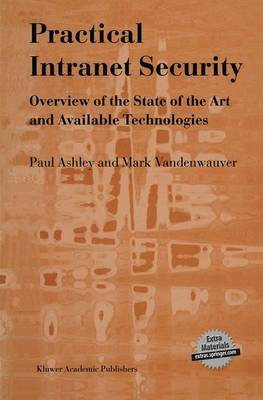 Previously books have concentrated on the Internet, often neglecting issues relating to securing intranets. However the potential risk to business and the ease by which intranets can be violated is often far greater than via the Internet. The aim is that network administrators and managers can get the information that they require to make informed choices on strategy and solutions for securing their own intranets. The book is an invaluable reference for network managers and network administrators whose responsibility it is to ensure the security of an organization's intranet. The book also contains background reading on networking, network security and cryptography which makes it an excellent research reference and undergraduate/postgraduate text book.